Japanese Episode AG 188: "Haruka vs. Shuu! Rivals Forever"
American Episode 458: "The Unbeatable Lightness of Seeing!" After their respective losses against Jindai and Saori, Satoshi and Haruka try to figure out what their next step is. Later, in the Pokemon Center, Satoshi and his friends are visited by Orchid-Hakase. The professor delivers a number of items from Satoshi's family and friends to keep his spirits up, including a postcard from his rival, Shigeru. It's at this time that Satoshi learns about the Shin'ou region, a new land far north of Kanto that has lots of new pokemon. With a renewed spirit, Satoshi decides to resume his training so he can finally conquer the Battle Frontier. Suddenly, Shuu arrives at the Pokemon Center! The Coordinator has a talk with Haruka and eventually offers to have a Contest Battle with her to help her get over her malaise. After Harley makes an unexpected appearance, the battle between Haruka and Shuu begins. Shuu's Roselia and Butterfree are able to defeat Haruka's Wakashamo and Agehanto, igniting a fire in Haruka's spirit to keep on training. Later that night, Haruka learns that both Shuu and Harley will be heading to the Jouto region to compete in the Pokemon Contests there! Haruka bids farewell to her rivals and decides to continue working on her performances while cheering Satoshi on in his final battle against the Pyramid King Jindai. I really like this episode a lot. It's a great set-up episode for Haruka's eventual departure, and it just goes to show how much the anime producers have learned about removing characters from the show since the series started. I mean, Kasumi's departure didn't even get half the amount of foreshadowing that Haruka got. She was just hanging out one day when -BAM- time to be a Gym Leader again. This also marks the last episode to feature Shuu and Harley. Both are great characters, and it's really sad to see them go since the people who will "replace" them in Diamond & Pearl just aren't as interesting. Oh well. I also like seeing Eneko and Agehanto again (they still exist! ), and the FIGHT!! banner with all the pokemon prints was a great touch as well. Though with all the throwbacks we're getting in this episode, you have to wonder where Odamaki-Hakase is. I mean, he is Haruka's professor, so wouldn't it stand to reason that he should show up one last time? If Orchid-Hakase can make the trek to Houen, there's no reason to think that Odamaki-Hakase can't do the same thing to Kanto. Finally, Nyasu dressing up as Sukizo is like the best thing ever. He seriously needs to find a way to bring that costume back. I also like that Musashi is recycling Yamato's Joi costume from their previous appearance. I'm still not digging PUSA's choice for Professor Oak. It's weird because I don't remember hating his voice so much in The Mastermind of Mirage Pokémon. But in these last few Battle Frontier episodes? It's barely tolerable. This episode also has an episode title that a lot of people don't really get. It's based on the book The Unbearable Lightness of Being, a novel that apparently deals with people making difficult decisions about their lives. So the title's not just a random collection of words like a lot of people seem to think. Eneko and Butterfree keep their Japanese voices. Scott: "When Ash gets pumped up, then look out." 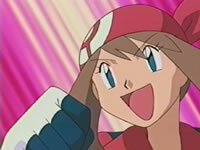 Professor Oak: "I recognize you from pictures, Scott, and I've always wanted to thank you for helping Ash." Scott: "It's an honor to meet you." Originally, Orchid-Hakase doesn't mention anything about seeing Enishida in photographs. He just remarks on how it appears that he's been helping Satoshi and then guesses his name. It's a really small detail, I know. But it stuck out to me for some reason. May: "You really gave me a shock back there. See, I was just thinking about you when all of a sudden, there you were." Drew: "Were they good thoughts?" May: "Ah! Come on! Of course they were!" The first line is pretty much the same in both versions. However, Shuu's response and Haruka's reaction are different. Originally, Shuu's line is "Thinking about me...?" which causes Haruka to respond "No, no...I don't mean like that." That's why she's kind of shaking her head and moving her hands when she says that. The Japanese version is a little less shippy than the dub, so that's why I thought I'd bring it up.